This article was published in the September 2011 issue of The National Law Journal. After a half-century of remarkable stability and steady growth, the legal industry got hit by a ton of bricks called the Great Recession. Several years after the initial shock, it is now clear that this downturn wasn’t just a momentary blip – but a rather sizable shift in the business landscape. As a result, law firms are being forced to reconsider many aspects of how they do business. What does all this mean for legal marketing? Lots. Focus more on attorneys – law firm websites will increasingly cater to the business development needs of individual attorneys. In short, a law firm’s website will no longer be considered supplemental marketing collateral. Rather, it will increasingly be thought of as a marketing platform that is central to all aspects of a firm’s marketing activity (online and offline). This may seem a radical notion for some firms. However, it is simply a natural reaction to major changes that have occurred in the business environment. Let me explain. Websites already play a vital role in law firm business development. Numerous studies show this. However, I strongly believe that they will become even more important – nearly as important as face-to-face meetings. Why? Because face-to-face meetings will happen less and less. The legal business has traditionally been very locally focused, with clients and the firm often located within 25 miles of one another. However, that’s now changing. The internet and related technologies have made it much more practical to work long distance. But that’s the least of it: our culture is also changing. One hundred years of the telephone, coupled with 15 years of the internet and 5 years of Facebook, has made a large cumulative impact on the way we relate to one another. We’ve all gotten used to managing long-distance “virtual” relationships – especially the under-40 crowd. And as businesspeople have gotten more comfortable with virtual relationships, they have become increasingly willing to hire attorneys outside their immediate geographic area. In short, we now live in a world where a client will hire an attorney located hundreds of miles away – as long as that attorney has highly specialized expertise that the client needs. This is forcing a shift in how attorneys think about business development. Old Thinking: Business development is a highly personal process, almost always conducted in-person, often over dinner and drinks. New Thinking: Your website will play a central role in business development as your client-base becomes more geographically dispersed. Here’s what it boils down to: legal marketing will increasingly be about demonstrating your specialized expertise. And, in a world in which your clients may be located far, far away, this will happen largely via content found on your website. If you accept the notion that the future of legal marketing is largely about demonstrating highly specialized expertise (as I argued in the previous section), this inevitably prompts the question: how exactly does one do this? The answer is, content marketing. This means creating reputation-enhancing content (like articles, blog posts, presentations, videos and podcasts) and posting them on the internet for prospective clients to read. Content marketing is arguably the most effective way attorneys can market themselves over long distances. Thus, I expect that as attorneys realize that attitudes towards geography are changing, you will see a massive explosion in the volume of content that attorneys create. The growth of “content marketing” beckons some interesting questions, such as: How do we organize all of this content? How can we maximize its business development potential? One thing is for sure – most current law firm websites cannot accommodate an explosion of content without becoming un-navigable messes. Thus, I expect a fundamental change in how law firm websites are structured and organized. The third major change to law firm websites will be a shift in their focus from the firm to individual attorneys. Old Thinking: The website is primarily a branding and marketing tool for the firm as a whole. New Thinking: The website will also become a tool that individual attorneys use to brand and market themselves. This represents a major change in how firms think about marketing themselves. However, it’s inevitable because the overwhelming majority of business is developed as a result of the efforts and reputation of individual attorneys. It only makes sense that firms looking to bolster their bottom lines would assist individual attorneys in growing their practices. I believe that the biggest structural shift in the next generation of law firm websites will be a significant expansion of the attorney bio. Why the focus on attorney bios? Because they are the most important pages on any law firm website. Our research shows that 56%–70% of the traffic on a law firm’s website occurs in the attorney bios section. And, according to a study by the Wicker Park Group, 90% of General Counsel say that attorney bios are the most important content on law firm websites – and are the places they visit most. Accommodate More Content – There will inevitably be lots more content, and it will come in many different formats – like video, podcasts and photo galleries. Allow for Personalization – As more and more business is pitched long distance, attorneys will want to make an emotional connection with people they’ve never met face-to-face. Integrate Social Media – Attorneys will want their social media marketing activity (on sites like Twitter and LinkedIn) to be reflected on their bio. One attorney might build his practice through writing and speaking. As a result, his microsite would showcase his intellectual talents by including pages for Publications, Presentations, Blog, Case Studies – in addition to basic biographical information. Another attorney might use a more social approach to marketing. Thus, her microsite could include a page of photos of her shaking hands with politicians and business moguls and another page of video clips of her television appearances. She could also showcase her social media activity by including feeds from LinkedIn and Twitter. A third attorney may be very established – and no longer be actively marketing himself. This attorney may not want more than a single page of biographical information. 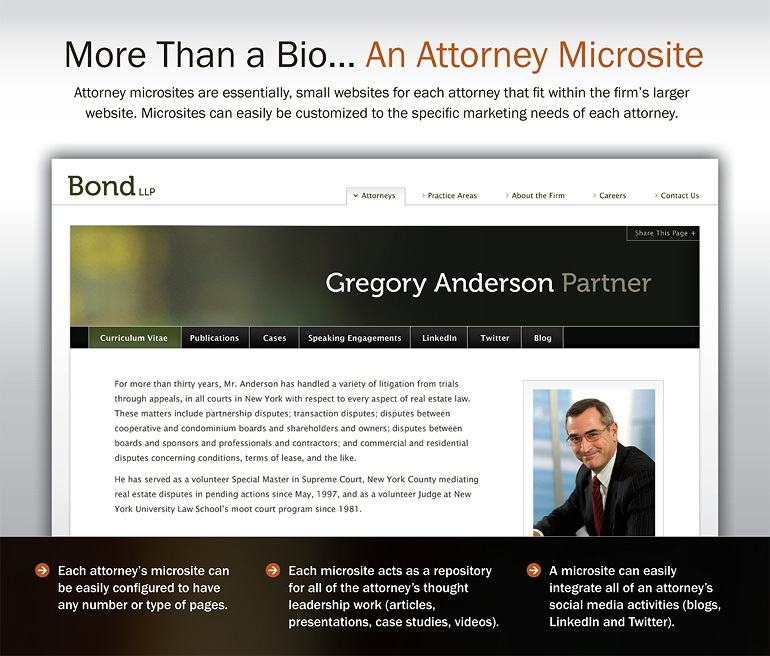 Attorney microsites are powerful because they give attorneys a flexible platform to communicate (and substantiate) their claims of authority in a particular area. As the focus of marketing shifts from personal interaction to web-based communication, it seems inevitable that the one-page bio will be deemed insufficient – and that attorneys will be clamoring for a more flexible and powerful marketing platform to promote themselves. 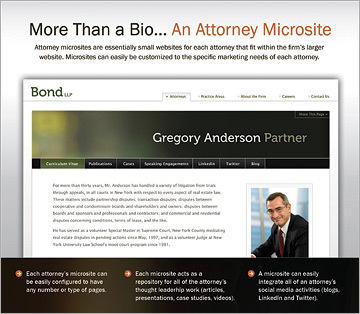 Attorney microsites are poised to fill this void. In recent years, however, these evolutionary shifts have felt like earthquakes. Why? Because the industry was slow to change in the boom years – and then the Great Recession came along and shocked everyone into action. Perhaps 10 years of evolutionary change was compressed into 2 or 3 years – and this felt like a seismic jolt. The good news is that the dust is settling and the path forward is now visible. As is often the case after an industry shake-up, a fantastic opportunity now exists for those firms that understand the new landscape and can adapt to it.